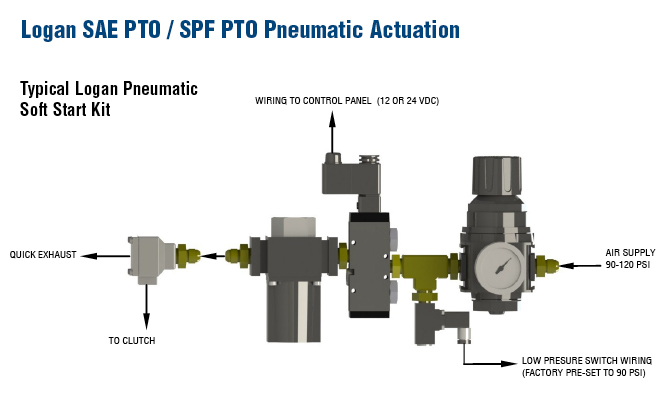 Operation: Logan Direct Drive SAE PTO’s require a 2 position, 3-way hydraulic valve with a system flow rate of 2 GPM (7.5 liters) to ensure proper response time during clutch actuation; (if the solenoid is not activated, fluid will not pass through the valve). 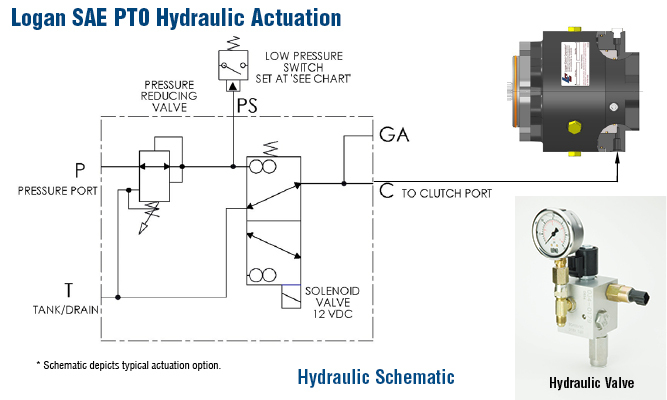 A pressure switch must be installed in the inlet line to ensure that a minimum pressure (see chart) is available prior to clutch engagement. Pressures exceeding the maximum clutch pressure will cause back plate deflection and premature clutch failure. Logan Direct Drive SAE PTO’s require an unrestricted port back to tank. It is not recommended to install a filter element on this return line, as any back-pressure exceeding 5 PSI (0.3 bar) will result in poor disengagement and excessive heat and wear. A 10-micron filter element must also be installed in the supply line before the valve, to minimize excessive dirt, oil and moisture. If a hydraulic source is not readily available on your equipment, Logan suggests using an hydraulic pump capable of producing 2 GPM. 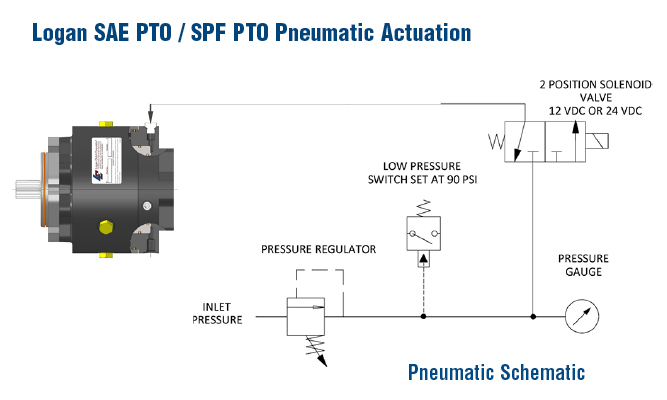 Operation: Logan Direct Drive SAE PTO’s require a 2 position valve to function properly, (if the solenoid is not activated, air will not pass through the valve). A pressure switch must be installed in the inlet line to ensure that a minimum of 90 psi (6.2 bar) is available prior to clutch engagement. Pressures exceeding 120 psi (8 bar) will cause back plate deflection and premature clutch failure. SOFTSTARTTM FEATURE/STANDARD: Autopilot Soft Start valve is preset to 2 to 3 sec. ramp-up using required air pressure. A 20-micron filter element must also be installed before the switch to minimize excessive dirt, oil and moisture. If an air source is not readily available on your equipment, Logan suggests using an air compressor capable of producing 0.14 SCFM at 120 psi (8 bar), with an air dryer with operating range between –4° F to 125°F ( -20°C to 52° C). An ATEX option is available. 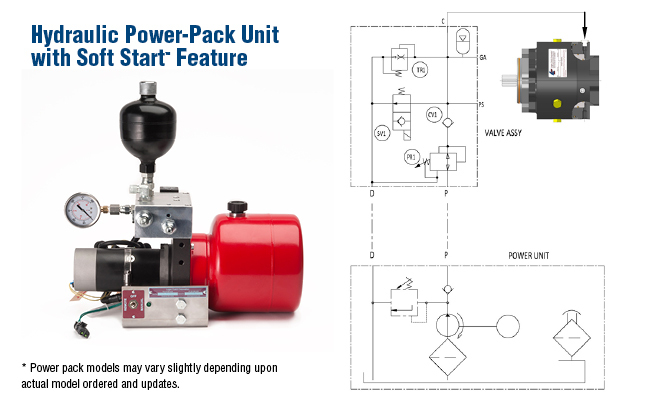 The Logan SOFTSTART Hydraulic Start-Up Kits are designed to simplify Logan clutch installation and to ensure reliable and accurate engagement of the Logan PTO. The auto pilot Soft Start valve is factory preset to 2 to 3 sec. longer ramp up times are field adjustable. Test ramp-up time at final installation prior to operation. Different ramp-up time may result in clutch failure. Adjust ramp-up time if necessary. Manifolds: Logan offers a solenoid activated, normally closed, 3-way directional control valve. Valves are available in 12 or 24 volt DC. For vehicles that are not equipped with an air or fluid source, Logan offer a hydraulic D.C. motor power pack. Units run when clutch is engaged and shut off when full actuation pressure is reached. Units are preset to re-energize when fluid pressure falls to a minimum pressure and relieve (through a pressure relief valve) when pressure exceeds a maximum clutch pressure. A local and remote provision for actuation is supplied. Operated by a 12 VDC or 24 VDC power supply, the power pack should be mounted away from the engine exhaust manifold, dirt and heat. Always refer to Logan Clutch Hydraulic D.C. Motor Power Pack Installation, Operation and Maintenance Manual for operating specifications, installation, maintenance and troubleshooting.